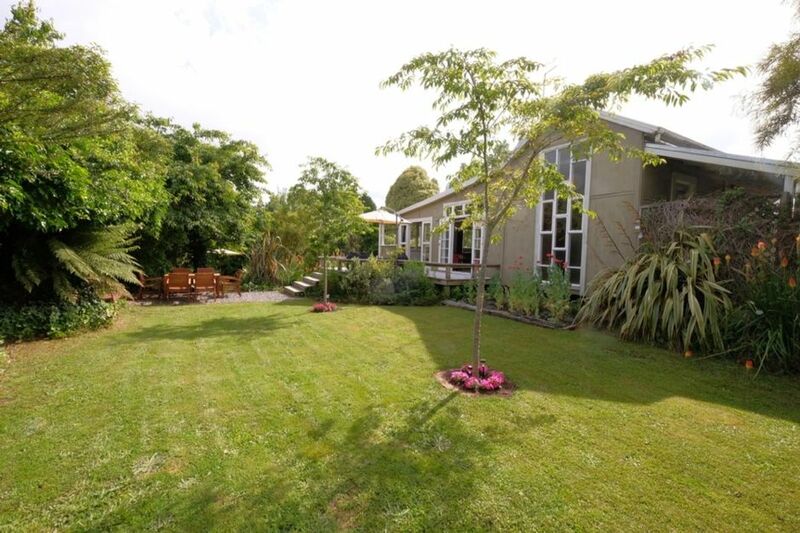 RUAPEHU CORNER is a unique and magical property featuring a 100 year old spacious cottage, a very cosy log cabin sleepout, and all surrounded by mature trees, lawns and gardens. Enjoy the best of both worlds in a rural location only minutes away from the many and varied activities and attractions this area has to offer. RUAPEHU CORNER is warmed by 2 fires(firewood provided) .The master bedroom and sleepout are warmed by eco heaters. RUAPEHU CORNER is fantastic for entertaining at home with a well equipped kitchen and large dining table both indoors and out, that both seat 10 plus comfortably. The house has 2 lounges .The Front Lounge has a comfortable 3 seater couch, fire and library and the lounge adjacent to the dining area having the added advantage of sliding doors enabling it to be totally closed off if required. First Lounge and Garage all have I-pod docks. RUAPEHU CORNER will be ready for your arrival with both fires blazing! For all bookings, a $300 bond is required and one off handling fee of $10 (bookings are not confirmed until receipt of this payment). For some properties a 50% payment of the rental is required at the time of booking. This will be advised in writing at the time of booking After this bond has been received, confirmation will be sent to you by email. The best accommodation for a big group of us on a ski trip! We had everything we needed and were perfectly located to get to the ski fields and a minutes drive to Ohakune village. We had such a great time and will definitely be coming back next year! Upon arrival the cottage looked very unassuming. Once you enter you are met with quite a spacious space that has all the conveniences you will need to enjoy your stay. Clean and tidy with a lovely outdoor space. Kereru in the tree just off the deck made a welcome appearance. We enjoyed exploring Ohakune and taking our children for their first trip to the snow. Nice combination of old style home with open plan kitchen and dinning. Kids love the loft and extra cabin. 2 min drive to the centre of town. Can see the leak of Ruapehu from the windows in the loft for that quick weather check for a photo shoot.